Wakefield Trinity Ladies head coach Wayne Hirst says his side has exceeded expectations after their season came to an end last weekend. Trinity came up just short in their play-off semi-final against Leigh Miners Rangers, going down 8-4 at Sharlston on Sunday. Wakefield were crowned Women's Championship League Leaders prior to their semi-final disappointment, finishing ahead of second-placed Stanningley on points difference. “Looking at it now, it has been a successful season for us and for me personally," said Hirst. “When we spoke early on in the season, all we wanted to do was advance on what the team did last year. “I think in two years they had only won something like three games." 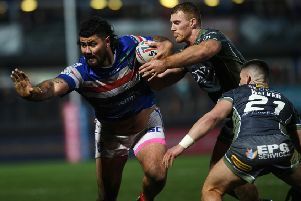 After a difficult couple of seasons for Wakefield, Hirst, who was appointed head coach prior to the start of the campaign, simply wanted to establish some stability. But after a flying start to the year, Hirst admits that Trinity were able to shift their ambitions toward the top of the table. “It was more or less a building season, to gather players and hopefully get as many wins as we could," he continued. “Obviously, at the start, you would like to say you can win the league but we didn’t really have much clue, it was more about getting some consistency and playing well. “So, to finish as league leaders is an amazing achievement. “If we had known at the start of the season we would top the league, we would have been over the moon with it. “And that is what we have ended up doing, so it’s been a really good season. “We won our first seven or eight games and then once we got into the top four, getting to the Grand Final was maybe a bit of a step to far. Hirst now has his sights set on a place in the Women's Super League heading into 2019. Wakefield are eligible for a place in the top tier of the women's game and are hopeful that they will be accepted into the division in time for next year. “For us, we want to look to recruit more youth to compliment the older, more-experienced players,” said Hirst when asked about the team’s plans for next year. “It is just a matter of continuing to build on what we achieved this season and we are looking at going into Super League. “As a club, we qualify to get into Super League with everything that we do in the community. “That is what we are wanting to do, but with the team we have now we would need to improve massively on what we have done this year.